This first cause is a post written by Kevin of Always Home and Uncool. He asked me to post this as part of his effort to raise awareness in the blogosphere for juvenile myositis, a rare autoimmune disease his daughter was diagnosed with on this day seven years ago. The day also happens to be his wife's birthday. Our pediatrician admitted it early on. The rash on our 2-year-old daughter's cheeks, joints and legs was something he'd never seen before. The next doctor wouldn't admit to not knowing. He rattled off the names of several skin conditions -- none of them seemingly worth his time or bedside manner -- then quickly prescribed antibiotics and showed us the door. The third doctor admitted she didn't know much. The biopsy of the chunk of skin she had removed from our daughter's knee showed signs of an "allergic reaction" even though we had ruled out every allergy source -- obvious and otherwise -- that we could. The fourth doctor had barely closed the door behind her when, looking at the limp blonde cherub in my lap, she admitted she had seen this before. At least one too many times before. The rash across her face and temples resembling the silhouette of a butterfly. The purple-brown spots and smears, called heliotrope, on her eyelids. The reddish alligator-like skin, known as Gottron papules, covering the knuckles of her hands. The onset of crippling muscle weakness in her legs and upper body. She then had an assistant bring in a handful of pages photocopied from an old medical textbook. She handed them to my wife, whose birthday it happened to be that day. This was her gift -- a diagnosis for her little girl. That was seven years ago -- Oct. 2, 2002 -- the day our daughter was found to have juvenile dermatomyositis, one of a family of rare autoimmune diseases that can have debilitating and even fatal consequences when not treated quickly and effectively. Our daughter's first year with the disease consisted of surgical procedures, intravenous infusions, staph infections, pulmonary treatments and worry. Her muscles were too weak for her to walk or swallow solid food for several months. When not in the hospital, she sat on our living room couch, propped up by pillows so she wouldn't tip over, as medicine or nourishment dripped from a bag into her body. Our daughter, Thing 1, Megan, now age 9, remembers little of that today when she dances or sings or plays soccer. All that remain with her are scars, six to be exact, and the array of pills she takes twice a day to help keep the disease at bay. What would have happened if it took us more than two months and four doctors before we lucked into someone who could piece all the symptoms together? I don't know. I do know that the fourth doctor, the one who brought in others to see our daughter's condition so they could easily recognize it if they ever had the misfortune to be presented with it again, was a step toward making sure other parents also never have to find out. That, too, is my purpose today. It is also my birthday gift to my wife, My Love, Rhonda, for all you have done these past seven years to make others aware of juvenile myositis diseases and help find a cure for them once and for all. To read more about children and families affected by juvenile myositis diseases, visit Cure JM Foundation at www.curejm.org. To make a tax-deductible donation toward JM research, go to www.firstgiving.com/rhondaandkevinmckeever or www.curejm.com/team/donations.htm. Earlier this week, I was invited to an event taking place in downtown LA as a guest of ConAgra Foods Foundation. To be perfectly honest (I'm all about full disclosure up in this), I didn't really know much about this event before I showed up. I knew that Sheryl Crow was going to be performing, that there would be celebrities, and that I would be rollin VIP. If you know me at all, you're thinking "BusyDad went for the free booze and cool wristband." Guilty. But when I got there and learned about the organization that this event "Rock a Little, Feed a Lot" (and ConAgra Foods Foundation) was supporting: Feeding America. They do exactly what their name implies. They make sure that children and families who need food get it. Through school programs and food drives, they move A LOT of food to those in need. Fortunately, this organization has the support of many high profile celebrities. And to be honest, I'm usually quite cynical when it comes to celebrities and causes (I used to be a publicist). But there are rare moments when you can't help but realize that a certain celebrity is genuine in his or her dedication to a cause. And hearing about how David Arquette mobilized an army of musicians, comedians and actors to turn this idea of a benefit concert into reality, I couldn't help but think, "this guy is the real deal." After he snapped this pic with me, I thanked him and started to walk away. But he stopped me and asked me what my name was. Why would a famous guy who is being greeted by dozens of people every minute even care about that? Because he's just good people. It's the little things that matter. Do me a favor? If you're on Facebook, become a fan of ConAgra Foods Foundation - they will donate 10 more dollars to Feeding America for each new fan they get until October 10. Oh, and Lisa Kudrow also played "Smelly Cat" live on stage that night. That's just awesome. 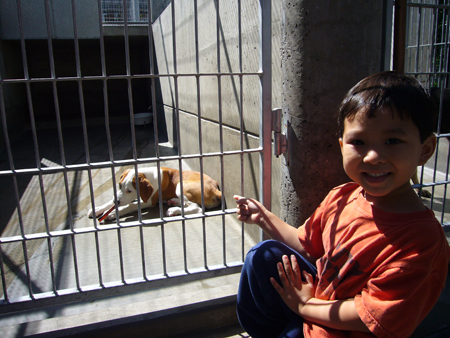 Pet adoption is a subject that's near and dear to me. I have the coolest mutt in the whole wide world and we got him from the Pasadena Humane Society (our other dog is cool too, but we got him from some lady who put a flyer up in the produce store saying she couldn't keep him because her apartment was too small, so he doesn't count as adopted, does he?). I have mentioned Krypto a few times on this blog. He even has his very own post about how he came to join our family. Anyway, anything having to do with pet adoption is worthy of mention on this blog, so I'm going to mention The Shelter Project. It's nothing outlandish or different. Just a cool campaign to get people to adopt pets from shelters. Because like a bowl of whole grain oats, it's the right thing to do.